TELECOMMUNICATION NETWORKS INSTALLATION - Montajes Temon, S.L. We perform the installation of all types of telecommunication networks and structured cabling systems. We install cables aerially (between poles or houses), buried underground, pulled through conduit, or in premises. We use single-mode and multi-mode fiber optic cable, coaxial cable and twisted–pair cable.We use cable blowing machines for the fiber optic cable laying and the Fujikura S60 and S70 fusion splicers to perform fusion splices. 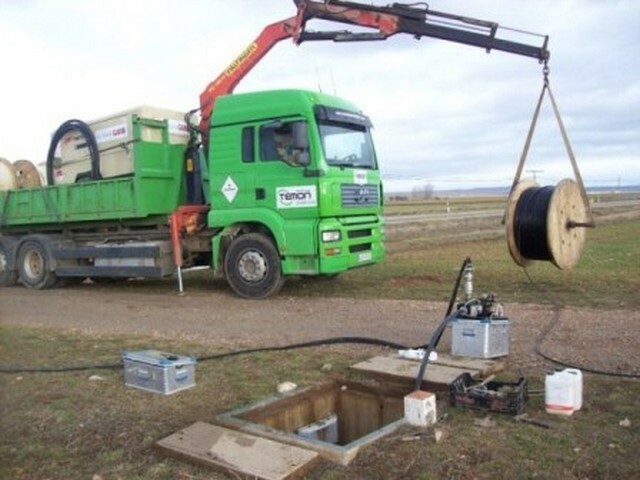 We always test our installation with power meters and certify it when needed with the JDSU MTS 6000 and 8000 OTDRs.Currently, we are installing FTTH (Fiber To The Home) for Telefónica, ONO-Vodafone and Orange in the province of Zaragoza and País Vasco. We are also installing it for Másmóvil in the provinces of Zaragoza and Teruel, and for Orange in Navarra. Besides, we are a company authorized by Telefónica, Vodafone, Orange, Adif, and DGT to perform fusion splices and the certification of the installations using an OTDR.